How times have changed. Back in my day if there was a supercross event on anywhere in Australia the promoter would be flooded with entries in all classes. My club in the outback town of Mt Isa even hosted a couple of supercross events back in the 80s and they were a huge success. Well, the opening round of the Queensland Supercross Championships that was supposed to be held last weekend West of Toowoomba was cancelled because they only got 30 entries. Now, before you start carrying on about the cost of racing ‘these days’ pull your head in!! I have done the maths ten times over and when you compare the cost of racing today to my era then look at what we were getting paid years ago compared to today’s wages, you have it pretty good. Anyway, the point is it has nothing to do with the costs, there is obviously an attitudinal change by riders (and their parents where applicable) compared to ‘the good ol’ days about racing supercross. I feel sorry for the people involved with the Queensland Supercross Championships because they put a lot of effort into their events. The Philip Island rounds of the Australian Supercross Championships has seen another Matt Moss demolition with the Suzuki pilot scoring maximum points over the two rounds and now carries a more than handy lead in the SX1 championship as they head to Brisbane in a few weeks’ time while Gavin Faith is also very close to wrapping up the SX2 title after a perfect weekend. See the full report and results below. How about Caleb Grothues? The young Sand Groper made the trek over to Las Vegas to race in the Super-Mini class at the Monster Energy Cup and was running a solid 8th in moto one until he crashed back to 18th place but in the second moto he caught and passed some of the best young supercross riders in the world to finish in 8th place out of 22 riders. This kid is a star of the future. As for our other Aussies racing the Monster Energy Cup the news isn’t real flash with Chad Reed almost having ANOTHER start straight crash (he had a big crash at the final round of the AMA Motocross Championships and the Motocross of Nations on the start straight) before pulling out of the event all together while Brett Metcalfe struggled with starts all weekend to finish well outside the top ten. See the full report and results below. On the subject of Brett Metcalfe, the Aussie has pieced together a privateer program and will race at selected rounds of the AMA Supercross Championships on board a Kawasaki KX450F in 2015. Another rider who is putting a privateer effort together for 2015 is Malcolm Stewart who has been over-looked by all of the teams. “No matter if I’m racing an 80, 125, or a 500 like Travis Pastrana, I’m still going to be at A1. I’m not going to sit on the couch because I don’t have a ride. I love this sport and I’ll be racing no matter what.” Stewart scored a more than credible 5th overall at the Monster Energy Cup on his own bike. James Stewart’s Therapeutic Use Exemption (TUE) for the substance he tested positive for at the Seattle Supercross in April has been accepted by the World Anti-Doping Agency, which performs the anti-doping controls for Monster Energy AMA Supercross an FIM World Championship. Unfortunately the exemption didn’t come through in time for James to be able to race the Monster Energy Cup. The final round of the World Off-Road Championship Series was held at Buffalo Bill’s Casino and Resort in Primm, Nevada last weekend and Kawasaki’s Robby Bell took the win from Justin Jones with Gary Sutherlin coming home in fourth which was enough to wrap up another AMA title for KTM. The FIM Speedway Grand Prix Commission has confirmed the field for the 2015 FIM Speedway Grand Prix (SGP) series including the four permanent wild cards and three GP Challenge qualifiers. Australia’s Troy Batchelor, Danish duo Niels-Kristian Iversen and Michael Jepsen Jensen and Swedish champion Tomas Jonasson have all been handed a coveted berth in next year’s World Championship while GP Challenge qualifiers Jason Doyle, Chris Harris and Maciej Janowski complete the full-time SGP field. Darcy Ward’s future in the series is obviously looking pretty grim after failing an alcohol breath test during the 2014 season. There is more to this than meets the eye. Frenchman Dylan Ferrandis has signed a long-term agreement with Kawasaki to continue in the FIM MX2 World Championship before moving to the USA. Ferrandis was part of France’s 2014 Motocross of Nations winning team. “I’m very happy to sign this long-term deal with Kawasaki.” Ferrandis commented. “I’ve been riding for them for several years now, and I feel so comfortable on these bikes. We’ve got a great relationship and our common goal is to win in Europe but also in the USA; that’s been a dream of mine for many years. I hope to get great results in the MX2 Grand Prix series with the MX2 team, and then move with the same goal in the USA. Jeremy Van Horebeek and Romain Febvre will be aboard the works YZ450FM for Michele Rinaldi’s team for the 2015 and 2016 FIM Motocross World Championship. The Honda 150 European Championship is open to 11-14 year-old racers with the winner receiving a Honda-supported ride in the EMX250 class on a Honda CRF250R. FMF KTM’s Taylor Robert took his first ever GEICO AMA EnduroCross main event win in Everett Washington tonight. And it was an incredibly exciting win as he battled with Rockstar/Lucas Oil JCR Honda’s Colton Haaker and Beta USA’s Cody Webb to take the narrow win. Webb, Haaker and Robert were also the three heat race winners on the evening to earn an extra championship point each. 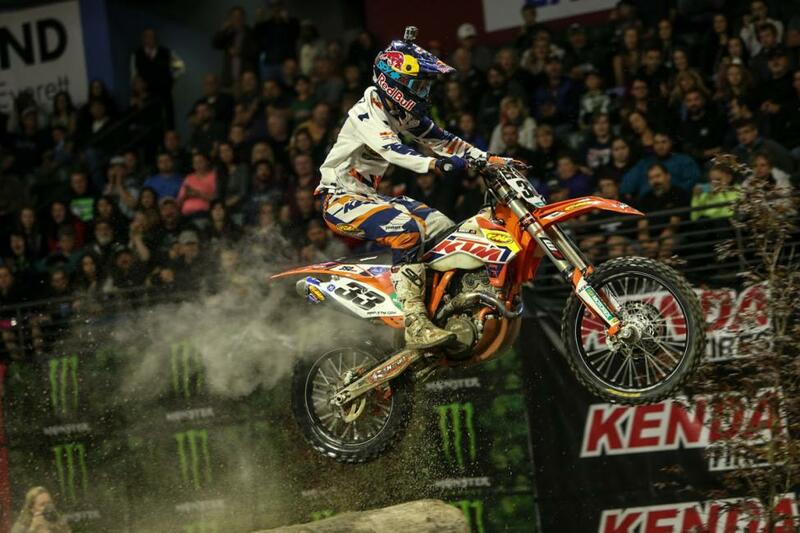 Red Bull KTM’s Taddy Blazusiak had an off night as he got second in his heat and then finished fourth in the main. The top six qualifiers do a Hot Lap against the clock during the evening show to earn their gate picks and another championship point for the fastest qualifier and GEICO supported Webb narrowly edged Robert to get that point. In the main event, Husqvarna’s Mike Brown took the $500 Nexen Tire Holeshot award and was followed closely by Webb and Cory Graffunder. Webb passed Brown to take the lead on lap one and quickly opened a decent lead. Haaker and Blazusiak were both outside the top five on the start but quickly moved to third and fourth respectively as they completed the first lap. Webb led for nine of the twelve laps and seemed to have another win in hand until he got stuck in an incredibly difficult rock section that caused problems for nearly every rider during the evening. Robert and Haaker both passed Webb and engaged in their own shootout for the win. Haaker closed right onto Robert’s rear wheel as they hit the rock section on the penultimate lap and then took his own tumble. Haaker remounted quickly and closed back in on the last lap but Robert held on for his first GEICO AMA EnduroCross win. Webb held on for third and Blazusiak took fourth ahead of Brown. 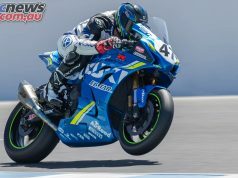 Bobby Prochnau took sixth on his RPM KTM, Max Gerston was seventh on a Beta, Kevin Rookstool took eighth, Ty Tremaine ninth and Cory Graffunder rounded out the top ten. For Haaker, the solid second allowed him to gain points on both Webb and Blazusiak. “Congrats to Taylor for staying up out there and being consistent” Haaker said. “I tried to make a pass and just went down right at the end but I am glad it was an exciting race for you fans”. Despite finishing third, the bonus point for the heat win and additional bonus point for setting the fast time during the hot lap allowed Webb to increase his lead to seven over Blazusiak. Haaker gained one point on Webb and is now nine back. Webb has 165, Blazusiak 158 and Haaker 156 with two races remaining. Overall Results: 1. Taylor Robert KTM. 2. Colton Haaker Honda. 3. Cody Webb Beta. 4. Taddy Blazusiak KTM. 5. Mike Brown Husqvarna. 6. Bobby Prochnau KTM. 7. Max Gerston Beta. 8. Kevin Rookstool KTM. 9. Ty Tremaine KTM. 10. Cory Graffunder KTM. 11. David Broderick KTM. 12. Jamie Lanza Husqvarna. 13. Wally Palmer Christini. Rounds 3 and 4 of the Penrite Australian Supercross Championship was contested in front of capacity crowds as part of the Tissot Australian Motorcycle Grand Prix weekend and team Motul Suzuki’s Matt Moss and Penrite Honda rider Gavin Faith were the dominant forces winning both SX1 and SX2 main events respectively. 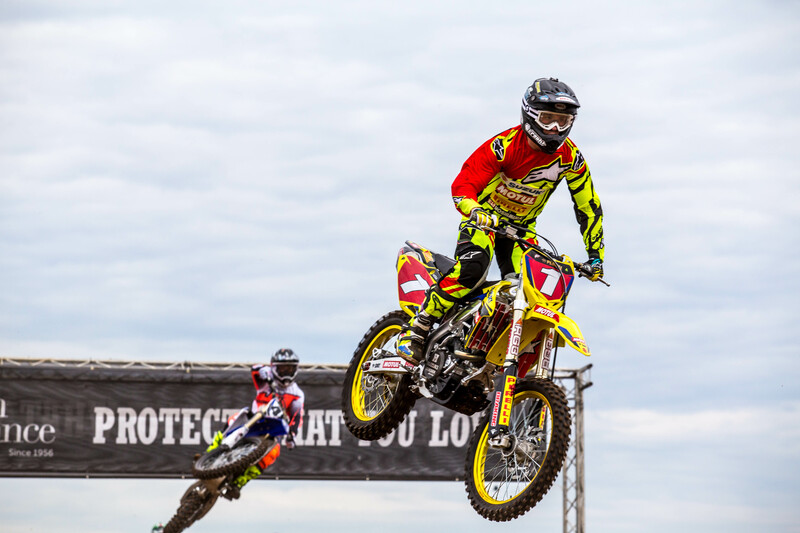 “Overall it was a great weekend and it was awesome to see such huge crowds turn out to watch the supercross,” he continued. “I am looking forward to the final round in Brisbane, we are taking the series back indoors which is where I first started. The atmosphere will be fantastic and I really want that final round win to take a clean sweep of the series,” Moss added. Moss has a 22 point lead over his teammate Lawson Bopping and NPS Kawasaki’s Adam Monea. In the SX2 class Gavin Faith won both main events which makes it three in a row and extends the American’s championship lead to 18 points clear of fellow Yank Kyle Peters and 23 points in front of Brendan Harrison who will be the home town hero in Brisbane. “I am looking forward to racing in Brisbane it will be my first indoors race in Australia,” Faith continued. The final round of the Penrite Australian Supercross Championship will be held at Brisbane Entertainment Centre on Saturday November 8. 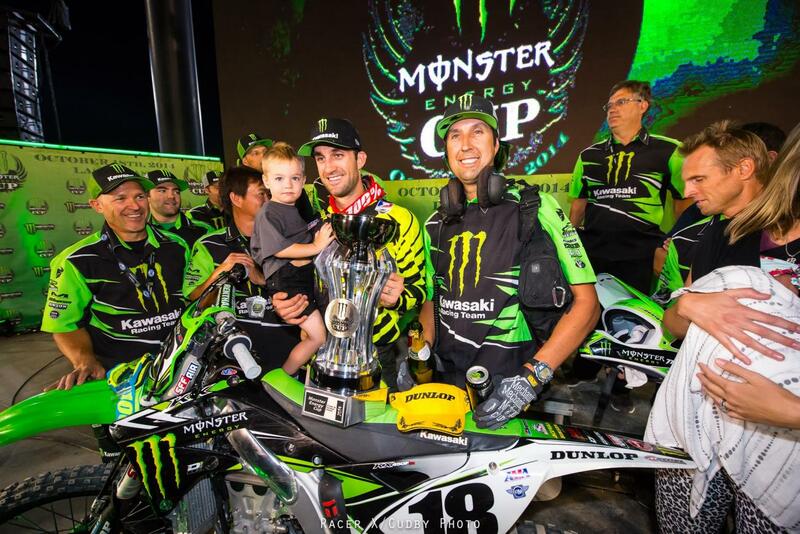 Monster Energy Kawasaki’s Davi Millsaps has spectacularly won the Monster Energy Cup and the $100,000 in prize money after three drams filled 10 lap main events. 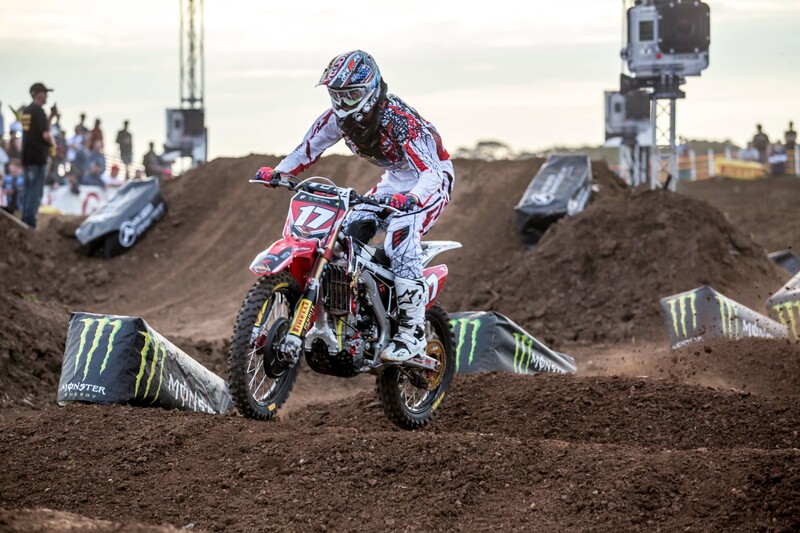 In the opening lap of the first Cup Class Main Event, Team Honda’s Trey Canard won the Toyota Holeshot Award with JGRMX/Toyota/Yamaha’s Justin Barcia and Rockstar Energy Husqvarna Factory Racing’s Jason Anderson in tow. Red Bull KTM’s Justin Hill quickly moved into second place and set chase to Canard. On the first Lap, Anderson, who set the fastest lap time in practice, crashed. Canard held off the hard charge from Hill and won the race. Hill finished second and Millsaps finished third. Once again, Canard earned the Toyota Holeshot Award in the Cup Class’ second Main Event. Hill and Millsaps followed in second and third respectively. On Lap 8, Millsaps moved into the lead while Canard opted to run the Joker Lane, a slower section of the track that every rider must take at least once after the first lap. 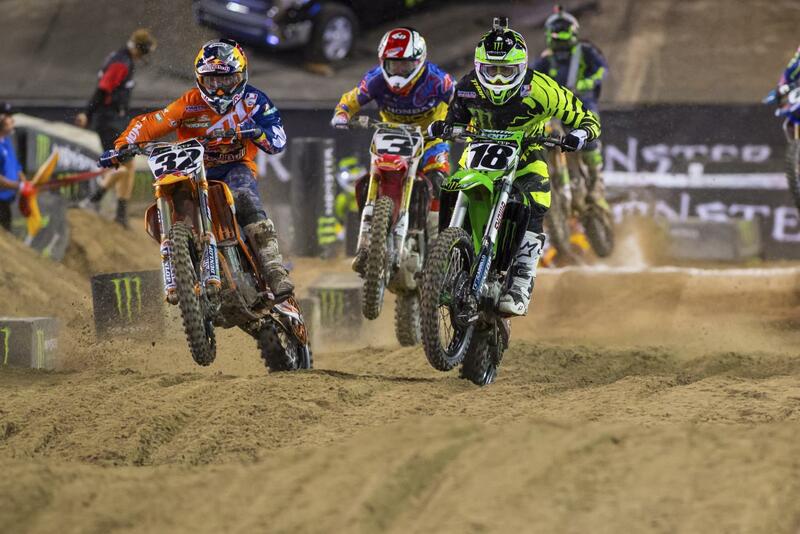 Millsaps entered the Joker Lane on the last lap of the race as Canard regained the lead. As Millsaps was exiting the Joker Lane he slid out and dropped back to fourth place. Hill finished second and GEICO Honda’s Eli Tomac finished third. After winning the first two Main Events, Canard put himself in position to win the $1 million and all he needed to do was win the third and final Main Event. Anderson captured the Toyota Holeshot Award in the third and final Cup Class Main Event with Millsaps on his rear wheel. Millsaps moved around Anderson on the opening lap to take over the lead. Canard took over second place on the opening lap and set chase on Millsaps. While setting up a pass for the lead, Canard crashed on a fast left hand sweeper handing the win to Millsaps with Tomac in second and Red Bull KTM’s Ryan Dungey finished third. Millsaps’ win came on his debut ride for his new team. Tomac finished second overall and Canard finished third overall. The surprise of the night had to be Justin Hill who was having not only his first major race on a KTM but is was also his first 450cc race yet the young up-start was able to come home second place in the first two races behind Canard and could well have won the overall if it wasn’t for a third turn crash in the final race. Tens of thousands of fans packed the Weston Super Mare beach front from one end of the North Somerset coastline to the other and with temperatures hitting around 19 degrees for most of the day, a vast majority of the crowd stayed right until all the riders crossed the finish line some three exciting hours after the race started. 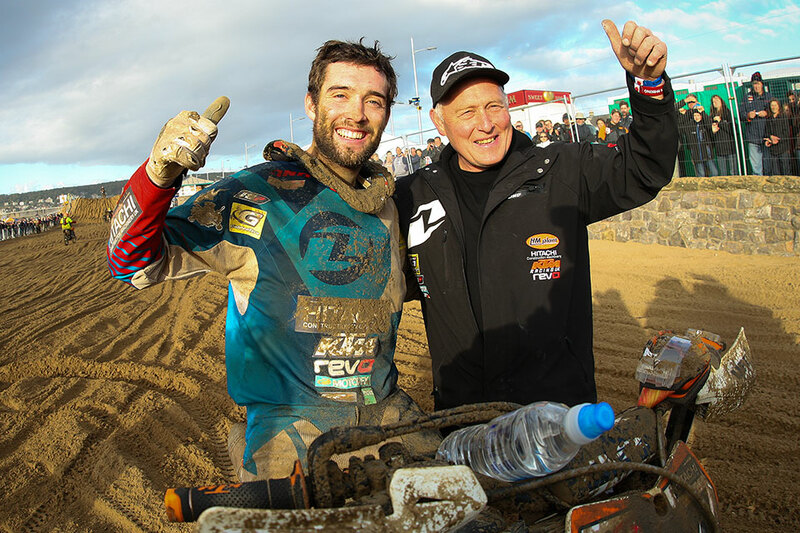 British MX1 motocross champion Shaun Simpson set the pace right from the word go, Shaun put in lap after lap of blistering times to win by over 5 minutes from second place rider and team mate Ben Watson and third placed Matt Burrows. Both riders tried in vain to close the gap on the Hitachi KTM star but with time running out, it was a tough ask due to the consistency of Shaun’s astonishingly fast lap times. Shaun Simpson: “It was great, you dream of perfect Weston’s, the fuel stops went perfectly and I would like to thank my family who all did an excellent job throughout the 3 hours. I never even fell off once, never stalled it – absolutely textbook race. I took the lead from the beginning and just held it really, I felt really comfortable and really strong and the bike was amazing. I made it to the first corner in first and then I knew I would be good in the dunes, I think I had a 5-6 second gap on the first lap – I’m ecstatic. Top Ten: 1. Shaun SIMPSON. 2. Ben WATSON. 3. Matt BURROWS. 4. Nathan WATSON. 5. Matt MOFFAT. 6. Dan THORNHILL. 7. James DODD. 8. Ashley GREEDY. 9. Frazer NORRIE. 10. Todd KELLETT.